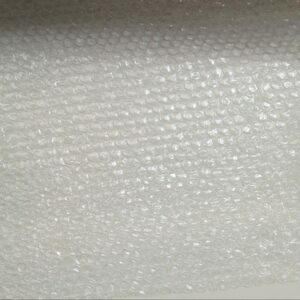 Clear greenhouse bubble wrap insulation, reducing heating costs and increasing your growing season for up to six weeks. UV stabilised, making it ideal for reuse. Can you use this for plant pots during winter? Yes. It works well to provide insulation to individual plant pots as well as greenhouses. Simply wrap the outside of the pot in the material and then gentle around the plant itself, leaving a gap over the top to prevent mildew. Will the material be easy to cut and shape around my planthouse? Yes. The material is soft and flexible. You can easily cut the product to size using scissors making it ideal for not only planthouse use, but individual plant insulation. How much would I need for a 5m x 5m greenhouse? You should find that either of our options (50m – 150m) would be suitable, the latter would leave you with plenty left over for individual use and would act as a sort of safety net to cover any mistakes you might make with installation. Is this product double layered? No, our product is single layered, however depending on your planthouse size you would be able to create this effect with our product. Our 150m insulation would certainly be enough to double-wrap. What’s the best way to install bubble wrap around my planthouse? Cut the product with scissors into sections and attach them separately. This is useful because it can be handled better in smaller sections. Attach it to the inside of the greenhouse, covering the windows. You can use heavy-duty tape or staples if you don’t mind causing slight damage to the planthouse.